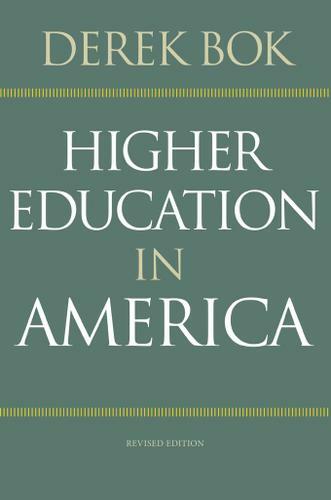 Higher Education in America is a landmark work--a comprehensive and authoritative analysis of the current condition of our colleges and universities from former Harvard president Derek Bok, one of the nation's most respected education experts. Sweepingly ambitious in scope, this is a deeply informed and balanced assessment of the many strengths as well as the weaknesses of American higher education today. At a time when colleges and universities have never been more important to the lives and opportunities of students or to the progress and prosperity of the nation, Bok provides a thorough examination of the entire system, public and private, from community colleges and small liberal arts colleges to great universities with their research programs and their medical, law, and business schools. Drawing on the most reliable studies and data, he determines which criticisms of higher education are unfounded or exaggerated, which are issues of genuine concern, and what can be done to improve matters. Some of the subjects considered are long-standing, such as debates over the undergraduate curriculum and concerns over rising college costs. Others are more recent, such as the rise of for-profit institutions and massive open online courses (MOOCs). Additional topics include the quality of undergraduate education, the stagnating levels of college graduation, the problems of university governance, the strengths and weaknesses of graduate and professional education, the environment for research, and the benefits and drawbacks of the pervasive competition among American colleges and universities. Offering a rare survey and evaluation of American higher education as a whole, this book provides a solid basis for a fresh public discussion about what the system is doing right, what it needs to do better, and how the next quarter century could be made a period of progress rather than decline.